KE00011 is a solid phase sandwich Enzyme Linked-Immuno-Sorbent Assay (Sandwich ELISA). 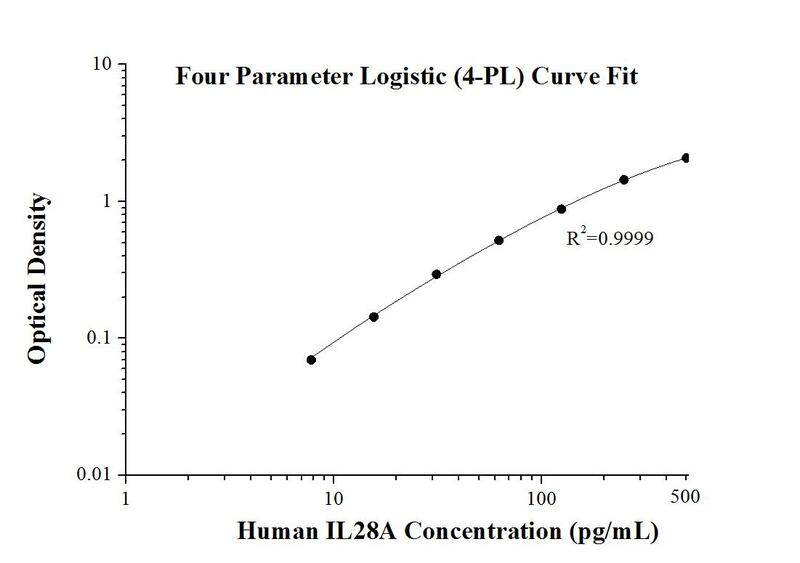 The IL28A ELISA kit is to be used to detect and quantify protein levels of endogenous IL28A. The assay recognizes human IL28A. A polyclonal antibody specific for IL28A has been pre-coated onto the microwells. The IL28A protein in samples is captured by the coated antibody after incubation. Following extensive washing, a monoclonal antibody specific for IL28A is added to detect the captured IL28A protein. For signal development, horseradish peroxidase (HRP)-conjugated antibody is added, followed by Tetramethyl-benzidine (TMB) reagent. Solution containing sulfuric acid is used to stop color development and the color intensity which is proportional to the quantity of bound protein is measurable at 450nm with the correction wavelength set at 630 nm. IL28A, also known as IFNL2, is a cytokine distantly related to type I interferons and the IL-10 family. IL-28A, IL-28B and IL-29 are three closely related cytokines classiﬁed as type III IFNs, which share many of the biological effects of type I IFNs but may have fewer side effects due to a more selective receptor distribution. All three cytokines have been shown to interact with a heterodimeric class II cytokine receptor that consists of interleukin 10 receptor, beta (IL10RB) and interleukin 28 receptor, alpha (IL28RA). IL28A is believed to play a significant role in the antiviral immune defense in the intestinal epithelium.